Italian:The next Italian Stammtisch (organised by an Italian student group called ACID) will be on Thursday 28.02.13 at 8 p.m. Where? New World – Ritterstraße 22 33602 Bielefeld (behind Thalia bookshop, near Cafe Kaffeeklatsch) For further information. meet every few weeks at different pubs around town (or organise visits to the opera or the christmas market). live music and a lot of weird objects. It starts at 8 p.m. – Another indoor flea market is at Kurz Um (near Siegfriedplatz) on Saturday March 2nd, this one starts at 10 a.m.
English with German subtitles on Sundays and Tuesdays. The Offkino has a Japanese screening of “Afterlife” on March 15th, it starts at 8.30 p.m.
amongst other things, something you can enjoy without any language skills at all. on March 16th. I’ve been there a few times during the “Nachtreise freier Theater”, which is a very good way to see little bits of productions all over town. 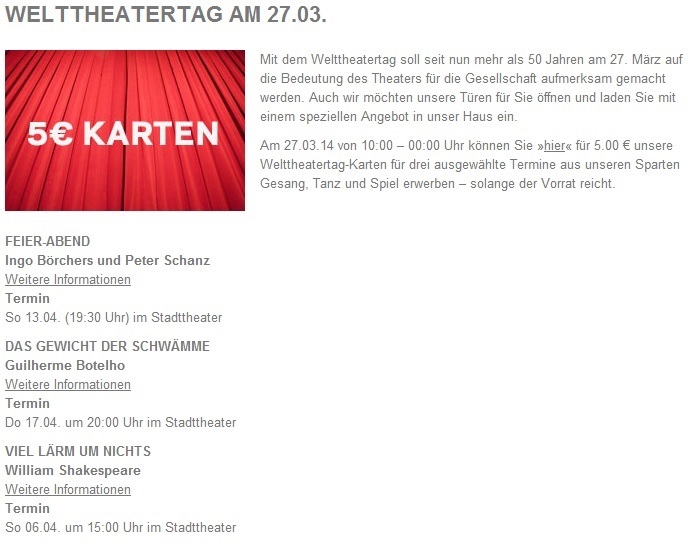 This one is an evening performance for adults, admission is 18, 22 or 24 Euros. To get there, take tram 4 until “Landgericht”.